Procrastination is a not a one time fight. It is an ongoing battle that must be fought and this battle must be won. This battle is not daily, it is moment by moment and the enemy is tricky. He is sly and will come at you in the guise of friendship. He will come along side you and speak soft words. He will entice you with his lies. He will tell you that your best thinking will happen tomorrow. He will deceive you into thinking the task at hand will wait. He will build you up with false praise encouraging you to wait because of something you deserve. He will lead to you to exchange the satisfaction of a task accomplished for the emptiness of the mundane. You must summon your courage. You must slay this enemy! I don’t win this battle every time. There are days I give in to this sleazy snake. The good news is that it doesn’t take much for this enemy to cower. It seems that the moment your sword is brandished it slithers underneath it’s rock. There are times where he might put up more of a fight and you will need to take a few swings of your sword, but momentum is on your side and once you get started you become an unstoppable force. Here is some wisdom to light your way. These are ancient words that serve as guardrails to keep you on the path. Along with these rails, here are five of my best arrows. Keep them in your quiver, ready to loose at the head of your enemy. Seriously, this practice doesn’t add time to your day, it multiplies the time in your day. Aristotle said, “It is well to be up before daybreak, for such habits contribute to health, wealth and wisdom.” Benjamin Franklin is credited for saying, “Early to bed and early to rise makes a man healthy, wealthy and wise.” Waking up early is one of those principles that everybody knows they should do but don’t. It’s kind of like knowing that Totino’s pizza is bad for you and eating it anyway. Sleeping late is the junk food of productivity. Anytime I need to process something I try to touch it only once. This includes digital items such as email or internet articles and physical items such as mail or paper documents. Decide if it’s actionable. If it’s actionable, do it if it’s takes less than five minutes, delegate it, or defer it to my task list or calendar. If it’s not actionable it get’s deleted or filed away for reference. Michael Hyatt describes this “workflow” from the Getting Things Done system here. I keep printed copy of the GTD workflow diagram in the pencil drawer of my desk as a reminder. Find the rhythm that works for you. When I was younger I could burn the candle at both ends. If I procrastinated I could stay up late and make up for my inefficiency. Married, four kids and three dogs, I just don’t have the energy anymore. Instead of focusing on time management I focus on energy management. Essentially this means grouping like minded things together and completing those tasks when I will be most effective for those particular needs. For example, I am most creative in the mornings so I will make room for the creative parts of my job in the mornings. It is essential to find a healthy rhythm for spending time with God, family, work, exercise and rest. Eliminate the excuses before they are excuses. I like to run in the morning; however, there are too many excuses to stay under the covers. It’s cold outside. I don’t want to wake my wife (or kids) up looking for my gear. I’m too tired. The hardest part of running in the morning is getting from my bed to my shoes. Knowing that once I get started those excuses will melt away, I plan ahead. I know exactly where the most resistance will come and I plan accordingly. I plan my running route the night before. I figure out the morning temperatures the night before. I gather my gear the night before. I go to bed early the night before. I eliminate the excuses before they can become excuses, the night before. This is not only practical, it helps by mentally preparing. The momentum needed to overcome the resistance didn’t start when my alarm went off, it started the night before. In a year from now, what will you wish you started today? There is never a perfect time to start something. We are seduced by the lie of an overnight success. I will let you in on a secret, there is no such thing as an overnight success. In our day of social media and instant gratification we are conditioned to only see the final product. If we were to look behind the scenes we would see the hard work, the sacrifice and the failures that lead up to what we see in our feed. It’s time to start. Sure, it might not be as pretty as you want it to be. The ride might not be smooth at all. In fact, after your first two steps you may realize that you need to take a different route. However, in a year from now you will be that much further ahead than if you waited to begin. 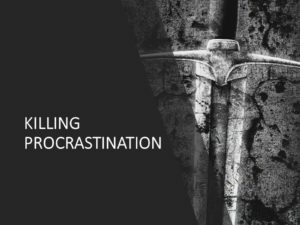 What is your best weapon for defeating procrastination? Subscribe to mikepackerblog.com and receive a free reading plan, 31 Days With Jesus. Mike Packer is the Lead Minister of Southeast Christian Church in Salt Lake City, Utah. He is married to Jamie. They have four children, three dogs, and seven fish. Mike loves Jesus and people. He is rarely found without a cup of coffee in his hand. Life is full of twists and turns. I have found that most people need a little encouragement. My hope for you is this site would be encouraging and inspire you to live your life to the fullest. Copyright © 2019 mikepackerblog.com – Powered by Customify.